Established in the year 2008, Canara HSBC Life Insurance is one of the major up and coming life insurance companies in the country. As the name implies, this company was established as a partnership between state-owned banker Canara Bank and the insurance wing of private banking firm HSBC. Another public sector bank Oriental Bank of Commerce also owns a considerable stake in the company. The company offers a diverse range of life insurance products for its customers. Customers who are interested in the company’s products can use the premium calculators and other tools to determine their exact requirements first. 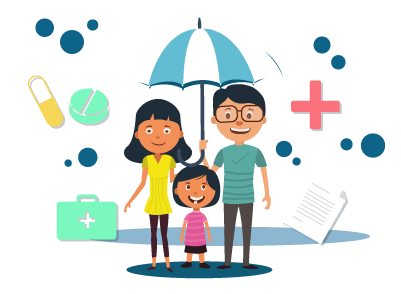 The cost of life insurance policies differs from one individual to another depending upon his/her age, income, lifestyle habits, and other factors. When it comes to savings/investment-oriented life insurance plans, the premium of a policy mostly depends upon how much the policyholder wishes to get back in returns. Depending upon these investment goals, policyholders can choose their life insurance cover. Another factor to be considered here is their affordability. Premium calculators allow policyholders to try out different sum assured options and choose the best one within their affordable range. By using premium calculators, customers can know how much they can earn from a policy and invest accordingly. On the menu bar, you can find the button labelled ‘tools and calculators’. Click on ‘calculate premium’ under this section and open the premium calculator page. On the premium calculator page, enter your personal details like name, gender, date of birth, residential state, product, payment frequency, policy term, sum assured amount, smoking habits, plan option, etc. Once you have entered these details, you can calculate the premium of the plan by clicking on the button labelled ‘calculate’. You may use the same process to determine the premium amount for other plans in the company’s lineup. After successfully calculating the price of the product, you may go ahead and purchase it if you are satisfied. Using premium calculators, customers can simultaneously compare the prices of various products available in the market. Since price is one of the major factors that influences the purchase decision, this helps them narrow down their choices and ultimately pick the right product suitable for their requirements. Customers can save a lot of time when they use premium calculators to calculate the premium of a product. The needs of customers vary from one to another. Customers can try out different options and opt for the right policy that meets their requirements. There are different types of investment-oriented life insurance policies available in the market. Thes include endowment covers, pension plans, child plans, ULIPs, etc. Customers can increase their knowledge about these plans with the help of premium calculators. Knowledge of different plans enables customers to make the right decision when it comes to choosing products. Companies can use premium calculators to market their products effectively and reach out to more customers in the market. In this way, insurers allow customers to calculate the premium on their own before coming to them for coverage. Life insurance is all about securing the financial needs of the policyholder’s dependents. This is the main reason why customers have the flexibility of choosing their desired products. Premium calculators are effective in helping customers understand their investment goals. The premium calculators offered by Canara HSBC serve the same purpose. By gaining knowledge about what they can get out of these life insurance covers, customers can make engage in proactive financial planning and make their investments in the right products.